Shakeology does have an expiration date. The good news is you won’t or at least shouldn’t have to worry about Shakeology ever expiring due to you using it everyday. But yes, Shakeology will expire after 2 years. 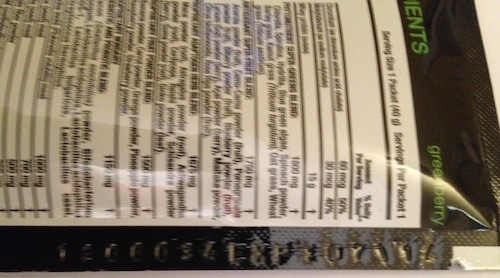 The easiest way to find out when yours will expire is to look on the back and then top right side of the packet or bag. Beachbody presses the expiration date into the plastic. Here is a picture of a Greenberry packet I have. Little tricky to see but it says 07/14 as the expiration date. Can You Use Expired Shakeology? I have drank Shakeology that was past its expiration date once. My parents had misplaced a bag in their pantry and found it two years later. We had just ran out and we’re waiting on ours so my Mom said I could have the old bag if I wanted. Was curious to see if it was still good so I took the bag and started using it. The two year old bag of Chocolate Shakeology tasted just like a brand new bag and everything worked like normal. I’d say you’d be ok using a bag of Shakeology past its expiration date. But I’m me. I’m ok with that sort of thing. I probably would have tried a four year old bag of Shakeology. But again, no need to worry when your Shakeology will expire. You’re supposed to be using up your supply within 30 days anyways. Just like how I’ve been a good boy and using it everyday for the past 7 years. I’m not sure but I know I’d use it.